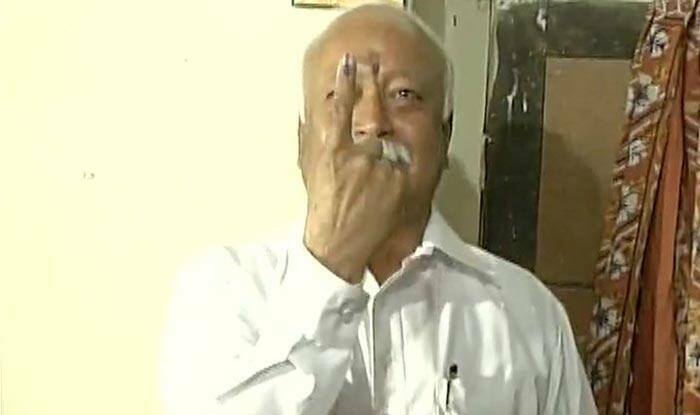 RSS chief Mohan Bhagwat, Union Ministers VK Singh and Satya Pal Singh cast their votes on Thursday for the Lok Sabha elections. Union Minister Satya Pal Singh who cast his vote in Uttar Pradesh’s Baghpat on Thursday also sought for re-election. He is contesting against RLD chief Ajit Singh’s son Jayant Chaudhary who is an SP-BSP-RLD ‘gathbandhan’ candidate. The polling began on Thursday morning in 91 constituencies spread across 18 states and two union territories in the first phase of Lok Sabha elections. Polling in underway in all the Lok Sabha constituencies of Andhra Pradesh (25), Telangana (17), Uttarakhand (5), Meghalaya (2) and Arunachal Pradesh (2) besides lone seats in Mizoram, Tripura, Manipur, Nagaland, Sikkim, Andaman and Nicobar, and Lakshadweep. Eight seats in Uttar Pradesh, seven in Maharashtra, six in Bihar, five in Assam, four in Odisha, two each in Jammu and Kashmir and West Bengal and one seat in Chhattisgarh are also going to polls. Voting for the 543 Lok Sabha seats is be held in seven phases on April 11, April 18, April 23, April 29, May 6, May 12 and May 19. Counting will be done on May 23.